So here we are in week two of the reboot of the DC Universe. Last week we had Justice League #1 which gave us some building blocks to this new DC Universe and the formation of its premiere team. 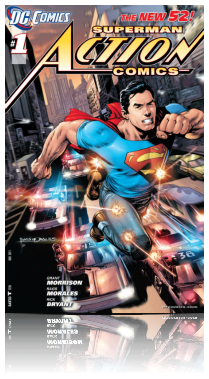 This week we have Action Comics #1 which does much the same for the company’s flagship character, Superman, this time with writing duties by Grant Morrison and art by Rags Morales. Admittedly I am very hot and cold on Grant Morrison’s writing. There are a lot of things he’s written that I don’t care for. That is in no way th case wth Action Comics #1. I am confident as the story progresses I will quickly go from liking it to LOVING it. What we have here is a “everything that was old is new again” story. This is the Superman who is faster than a speeding bullet and able to leap tall buildings in a single bound. And it’s great!! Morrison is able to strip this character back to basics, harkening to his original concept while giving him modern sensibilities. We have a young man who is learning about his powers and isn’t afraid to show off. He hasn’t learned to fly yet so he runs through the city evading police. That's right folks, evading police. Metropolis isn’t the shining city it’s usually perceived as, but one full of corrupt cops and organized crime. Best thing Grant Morrison and DC Comics did was give Superman a lesser level of invulnerability. He’s as much of a God as he once was, at least at this point in his development and it really helps to make him more identifiable and brings excitement in danger to the book. There is a particular touching scene where Superman is almost captured by Soldiers after saving a building full of people trapped while it’s being demolished. The rescued people gather to protect Superman and give him time to escape. It’s a nice moment that shows the city has chosen their champion and are willing to protect him. We are also introduced to Lois Lane and Jimmy Olsen who work for a rival newspaper at this point in the new DC history. 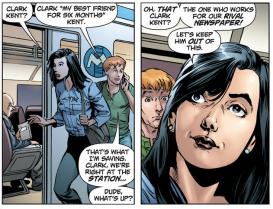 It also seems like Jimmy is the same age as Clark and Lois which doesn’t seem to take away from anything. Action Comics #1 is a fantastic issue. I can’t encourage you enough to pick it up.